Star Wars is perhaps the most storied franchise in cinema history. It’s a series that has captured the imaginations of even the most disinterested of laypeople. Its universe is home to some of the most cherished and recognizable movie characters. Yoda, for instance, is prominently featured on advertisements for the Star Wars brand despite not making a motion picture appearance in over a decade. The characters are timeless, but without the series’ signature costume design, it’s difficult to imagine little Darth Vaders visiting doorsteps on Halloween. 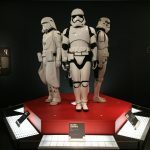 To celebrate the nuance of the series’ iconic apparel, the Museum of Fine Arts in St. Petersburg presents: Star Wars and the Power of Costume, an exhibit chronicling forty years of Star Wars costumes and props. 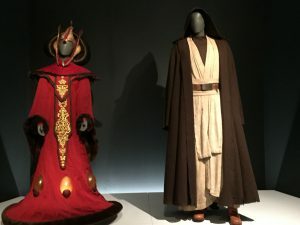 The journey begins with a side-by-side display of Padmé Amidala’s royal robe and Obi-Wan Kenobi’s Jedi robe. The complimentary audio guide, narrated primarily through adorable conversations between a rather zealous man and woman, cast light on the conception of each costume. The guide is also superabundant with behind the scenes trivia. For instance, while on set, Alec Guinness (Obi-Wan) rolled around in sand to give his character a more nomadic appearance. The stark contrast between Padmé’s elegant, kimono-inspired gown and Obi-Wan’s humble garb creates an unsettling timeline of how Darth Vader’s rise to power devastated the galaxy. This may seem like an unusual choice of display to headline the exhibit, but it calls to mind an important theme of Star Wars: the literal and self-aware dichotomy between good and evil. While this may sound absurd in a story that ostensibly takes itself seriously, the struggle between the light and dark sides is always handled with a guiltless earnestness that makes the “goodies” easy to root for, and the villains a delight to hate. From this point forward, the costumes of the light and dark side characters are cleverly relegated to opposite sides of each room. The first room also features a mannequin modeling Princess Leia’s white turtleneck gown in an appropriately sassy pose. 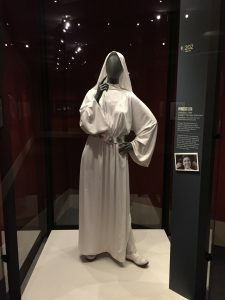 In the caption, the late Carrie Fisher recalls how her costume’s modest design was intended to convey her character’s purity. 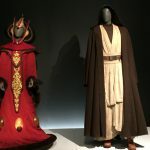 While this characterization may seem obvious, it demonstrates how Lucasfilm prioritized making each character’s apparel a wearable biography. This becomes even more apparent in the second room, which houses the series’ military uniforms. A wall of text explains how George Lucas wanted the Rebel Alliance to resemble U.S. Marines, and the Galactic Empire to look like Nazis. The engineering behind the artistic elements of costume design is something the average moviegoer is likely to take for granted until they’ve seen it done poorly. The straightforward and memorable costumes of Star Wars are a testament to the precision of the series’ visual vocabulary. 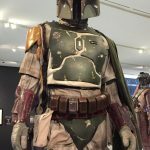 What’s often even more interesting than the costumes themselves, however, is seeing the surprising, terrifying, and cringe-worthy phases these get-ups went through before they made their mark in Hollywood, and the Power of Costume is flush with concept art. 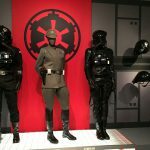 The next room contains the costumes of the supporting cast, the Force Awakens costumes, and sketches of unused designs for droids and other non-human characters. Early renderings of C-3PO show him with minimal facial features, bearing a coincidental resemblance to the helmet worn by Billy Campbell in Disney’s the Rocketeer —a fine design, but perhaps not human enough to convey the emotions of a character who’s effectively a neurotic parody of robotic sidekicks like Forbidden Planet’s Robby the Robot. Similarly, Chewbacca was originally rendered with stout, less humanoid proportions, and a feral expression. These horrifying designs would have likely invited inaccurate snap judgments of Chewbacca’s alliance and made him difficult to merchandise. Darth Maul, the colloquial prequel analog of Darth Vader, underwent, perhaps, the most drastic redesign. When conceptualizing the deadly Sith Lord, artist Iain McCaig was instructed by Lucas to draw a “figure from [his] worst nightmare.” McCaig’s initial rendering of Darth Maul was a muscular pale humanoid with thick, lacy hair draping over protuberant eyes and a malicious grin. When he presented this terrifying sketch to Lucas, he was asked to “draw [his] second worst nightmare” instead. The following room recreates Obi-Wan’s climactic face-off with Darth Maul using mannequins and authentic lightsabers. Museum-goers are given a 360 degree view of the scene, spotlighting how intimidating the Sith Lord’s double-bladed weapon really is. Captions and a video discuss the choreographic swordsmanship behind this kinetic duel. The ground floor concludes with a pair of rooms dedicated to two of Star Wars’ most iconic characters: Darth Vader and Yoda. Posing grievously with his hand clenched, Darth Vader stands ready to force choke any tourist irreverent enough to use him for a photo op. This room also features 14 photos with captions outlining the elaborate process of dressing Darth Vader. Yoda’s designated room is appropriately small with a scale model of the wise old Jedi stands upon a pillar with a selection of his quotes painted on the wall. 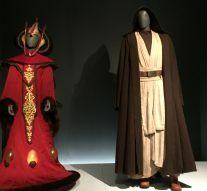 Upstairs, the exhibit concludes with a large room dedicated to the many dresses of Padmé Amidala. According to the concept artists behind her diverse wardrobe, the elaborate design of her apparel made it painstaking to create. 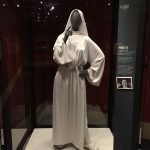 Some of these dresses only appear on screen for a few seconds, and the audio guide confirms that Padmé’s wedding dress was indeed fashioned from a bed sheet. 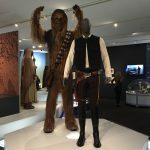 Star Wars and the Power of Costume is enjoyable enough as an exhibition of Hollywood ensembles, but its desire to immerse museum-goers in the movie making process through concept art and behind the scenes anecdotes make it a must-see for Star Wars fans. The exhibit is open until April 1, 2018. With The Last Jedi rekindling public interest in the series, the Museum of Fine Arts in St. Petersburg recommends purchasing tickets in advance. Enjoy your visit to a galaxy far, far away, and may the force be with you.